Jennifer and her cat, Smoke. Some people discover the allure of Maine later in life; some have family histories that go back for generations. Then there are those who trace their ancestry back to a period just after the ice age, about 12,000 years ago. 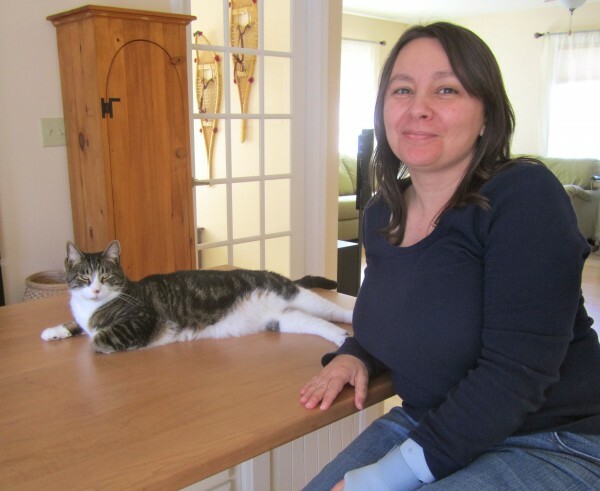 Jennifer Sapiel Neptune, 41, is a member of the Penobscot Nation, a living descendant of Maine’s earliest inhabitants. I visited her home on Indian Island, where she lives with her husband and two exuberant cats. We sat at the kitchen table, where a pile of ash splints waited Jennifer’s expert hands to weave them together into a basket. A broken wrist has kept Jennifer from basket work for several weeks, but she is able to continue with her beadwork, equally exquisite and more wrist-friendly. Just about every Penobscot family, Jennifer tells me, has basket makers in their pasts. It was a craft that grew among their people by necessity. 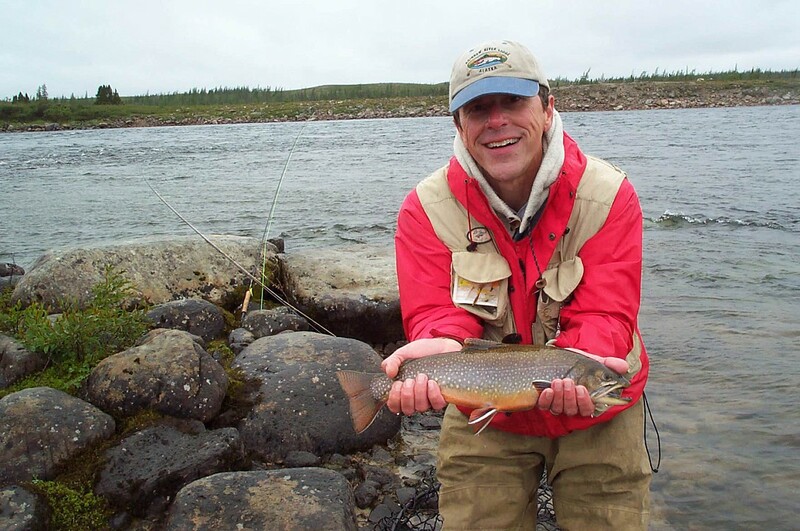 When European settlers changed the landscape through logging, dams and development, the lifestyle that native people had known was no longer possible. They had to adapt to a cash-based culture in order to survive, and their skills as artisans became their livelihood. Jennifer’s father remembers helping his grandmother dye ash splints for her basket making one summer, in return for a new bicycle at summer’s end. Today, basket makers still trim and peel brown ash logs, pound them until they separate into growth rings, and split sections into strips for weaving. As Jennifer practices this ancient art, using the same techniques from generations past, she has felt a deep connection to her great-grandmother and those before her. 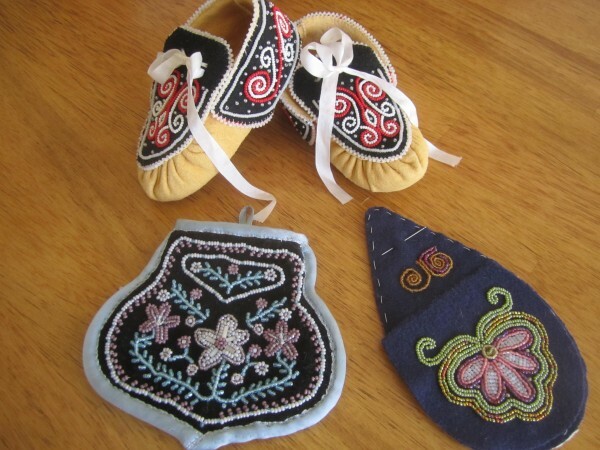 Jennifer has dedicated much of her life to studying old artifacts from the four Wabanaki tribes — Micmac, Maliseet, Passamaquoddy, and Penobscot. She has a degree in anthropology from University of Maine in Orono, with a minor in native studies. In one of her publications, Jennifer writes about being a teenager in the library, poring over photographs of Penobscot artifacts in collections all over the world. “I dreamed of being able to visit these objects, to study them up close, and to be able to bring them back into our world.” She has done just that. But Jennifer’s interest in her ancestors goes beyond handwork. She managed a gallery of Wabanaki art for eight years. 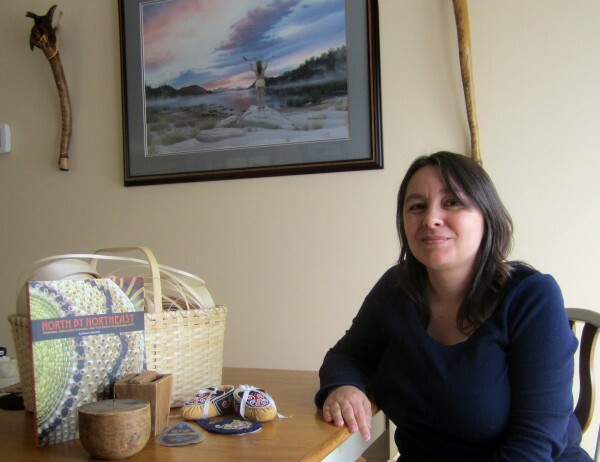 She works for the Maine Indian Basketmakers Alliance to preserve the cultural and artistic legacy that connects the past, present and future. She contributed to “North by Northeast,” an exquisite new book of contemporary reproductions of traditional arts. She is learning the art of creating tinctures and oils from medicinal plants. To protect the ash tree, source of traditional basket making, she works with university anthropologists and foresters strategizing ways to cope with the emerald ash borer, an insect that has killed tens of millions of ash trees across the United States. At one time Jennifer worried that she was dividing her time among too many different paths. But she realized over time that each skill and art helped to inform the others and enrich her understanding of her cultural heritage. “They were weaving, like a four-stranded braid, strength and beauty into my life.” More than that, they are a loving, living testament to the culture of her people.